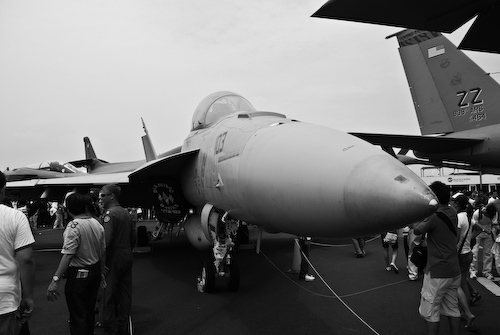 I trooped down to the Singapore Air Show this weekend. As did others – to the tune of tens of thousands. I haven’t seen a closer approximation to the Kumbh Mela in Singapore. It was on one extreme end of the city, involving a 40 minute bus ride even after the last train stop; involved over 2 km of queues to get into the bus and into the registration gate, where everyone had to go through airport-like security with X-ray machines and metal detectors and what not. It’s amazing how many restrictions we’re willing to bear in order to have a glimpse of freedom. Freedom from bonds that bind. To soar limitless. To choose a direction at random from the infinity of space. And to defy the one force that always keeps us down. I’ve always loved flying. 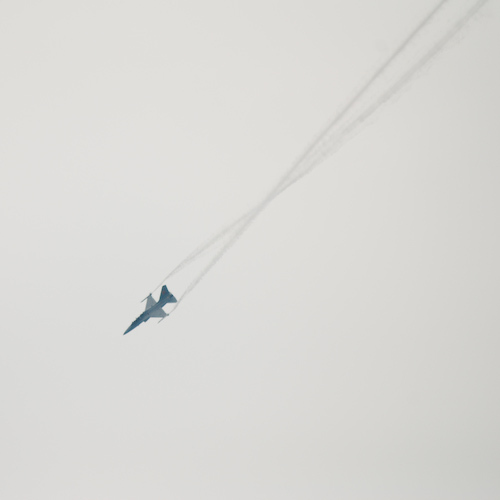 I was at the airshow to feel flight, and I wasn’t disappointed. I caught these jets in formation just as I stepped off the bus. I couldn’t see their antics because I was stuck at security. Then it was time for the single fighters to show off. I loved this part. Having played more than enough flight simulations in my time, I know these stunts are not as easy as the pilots make them look. It was fun to watch the jet spin in a nosedive and imagine the pilots point of view – where the whole world turns in front of you. Pure power was on the menu here. There were, I think, three different jets that made the rounds, and for a while I was just up there, testing the sky’s limits with them. Somebody should tell Airbus to fix their marketing department. 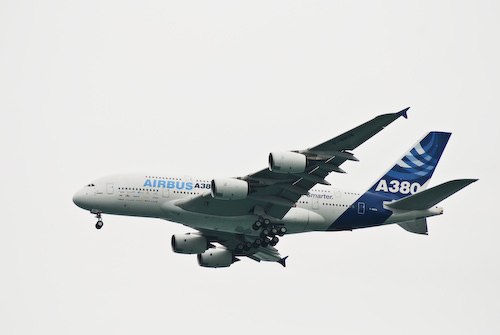 Yes, you’ve designed the largest aircraft in the world and it is a marvel of engineering in many ways. But the last place you want to show it off is right after an F-16 has shown the world what it can do. It’s like after watching a Ferrari zoom past, you’re treated to the sight of an ox-cart drawn by a cow named Phulwaari on the F1 track. Finally there were the propeller planes. If the fighter jets gave the impression that they were defying the laws of physics with raw power, these birds were the epitome of grace. 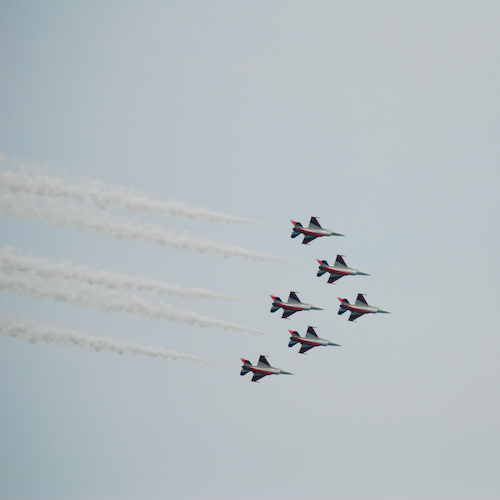 Certainly not fast but they flew in beautiful formation. This particular maneuver, where they flew in a backward vertical circle and then veered off in different directions, was simply magical. It was also the only time when the audience as a whole burst into spontaneous applause. The ground exhibits were interesting too but there were just too many people. Planes pack so much beauty, grace and power; but that gets lost if there are people crawling all over. Much like a delectable chocolate cake doesn’t look as mouth watering when surrounded by ants. Not that I didn’t enjoy seeing them up close. It would have been fun to go see them from the inside but I couldn’t muster up the resolve to get in the queues that that entailed. So as you can see from the pictures, it wasn’t a very good day for photography. Steel gray skies and too many people to get any real good photos of the planes on exhibit. So I needed my camera fix, and I ended up taking some photographs of the people. 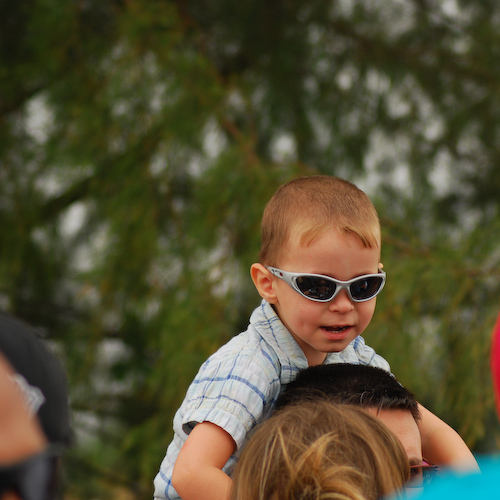 Some people had got kids to the airshow, which was good to see. But too few. People should get their kids to see such stuff. They are the ones who have imaginations deep enough and souls free enough to dare and dream their dreams around the wonderful things they see. 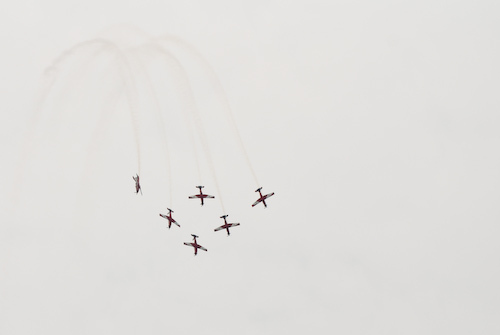 They are the ones who will remember a day at the airshow a few weeks, months or even years from the day, and maybe change their lives as a result. This was written by Anshul. Posted on Monday, February 25, 2008, at 2:45 am. Filed under events. Bookmark the permalink. Follow comments here with the RSS feed. Post a comment or leave a trackback. 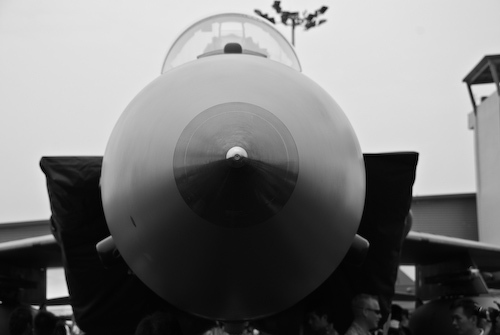 If you ever get the chance to go to the airshow in Paris, I wd highly recommend it – it’s massive!